TNR is a humane program run by community rescue organizations and volunteers. With time and patience, TNR volunteers trap all the feral cats in a colony, spay and neuter them, then return them to their home. The altered cats continue to live happy lives but no longer reproduce. With no more kittens, the numbers of feral cats decrease and the quality of their lives improves. Annoying behaviors and stresses associated with mating, such as yowling and fighting, stop. Their care takers continue to feed them on a regular schedule and this ongoing care creates a safety net for both the cats and the community. Kitty Cat Round-up is the HOPE Spay Neuter Clinic's Trap, Neuter and Return (TNR) program for feral cats in Central Kentucky. Since the first Kitty Cat Round-up in March 2004, over 4,000 feral cats have been sterilized and vaccinated! We devote one day per month from February through November for spaying and neutering feral / free-roaming cats. If you or someone you know is the caretaker for feral cats and would like the colony to be included in a future Kitty Cat Round-up, please call us to schedule an appointment 859-873-4673 and leave a message in Mailbox 4. The Kitty Cat Round-up TNR fee is $15 per cat unless they reside in Woodford County, in which case a donation is requested but there is no specific fee per cat. Our volunteers teach you how to set humane traps near feral colonies several days before the date of the "Round-up." This gets the cats accustomed to the traps for an easier capture. Once trapped, you transport the cats to the HOPE Spay Neuter Clinic in Versailles, Kentucky for surgery. 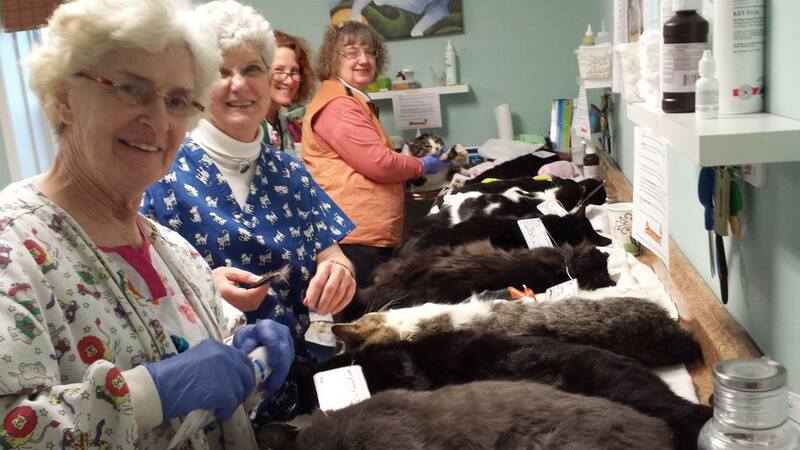 Upon arrival, a team of volunteers prepares the cats for surgery. After surgery, HOPE volunteers monitor the feral cats' recovery and you are able to return to them to their homes. This is often the only time these cats will ever be touched by human hands. Approximately 500 feral cats in Kentucky are altered annually by our Kitty Cat Round-up Program! Feral cats are either born outside and have never lived with humans, or have been left outside for so long they've reverted to a wild state. Most live with other feral cats in “colonies.” They're afraid of humans and not likely to be adoptable. The incidence of disease in feral cat colonies is no higher than among owned cats. They live healthy, natural lives on their own, content in their outdoor home. Most feral cats are euthanized. Feral cats are wild animals and not adoptable. As a result, most are euthanized when they are removed from their outdoor living environments. Stray cats are not feral cats. Stray cats are domesticated and have been abandoned or wandered from their homes. Generally, strays are adoptable. Found a colony? Let us know. We want to help you and your feral cat colony. We have humane traps for loan and our knowledgeable team of caring people can educate and assist. Ear-tipping is vital for identifying feral cats that are already altered and have caretakers. Ear-tipping is the national standard for identifying feral cats managed through TNR (Trap-Neuter Return). In Woodford County (Kentucky), if an ear-tipped cat is caught by animal control agencies, they know the cat is from a managed colony and simply release it. Ear-tipping also allows a caretaker to easily spot a new cat entering the colony. Eliminating Feral Cats isn't Effective. When feral cat colonies are trapped and euthanized, other cats simply move in and take advantage of the available resources. They breed prolifically; quickly forming a new colony to size of the old one. This "vacuum" effect is well documented. TNR is a more effective and humane approach to stopping the overpopulation crisis. With an estimated 87 million free-roaming, homeless cats in the United States, it would cost the government about $16 billion to trap and kill them as opposed to about $9 billion for supporting Trap-Neuter-Return (TNR) programs run by community rescue organizations and volunteers.